The digital age is an exciting time to be working in the enterprise space. Now more than ever, companies are working diligently to be customer centric. To be successful in these endeavors, companies need to achieve a single view of their customers across the entire buying cycle. Focusing on customer satisfaction, obsessing over streamlined operations, and making customer buying actions easier are becoming the hallmarks of a thriving business. A lot of customers are noticing this shift in provider mentality. Rather than limiting themselves to just a single transaction-based relationship, leading companies are investing in related services that can become part of the customer’s overall experience and the basis for a lifetime customer relationship. To have a single view of the customer, companies must have a seamless enterprise landscape where the front and back offices are completely in sync. For a truly holistic customer experience, companies need to ensure they have a completely integrated operation to achieve enterprise-wide intelligence. This unified enterprise landscape enables companies to deliver on customer trust. To be truly valued by your customer, a company ultimately needs to harness all available data, which in turn enables capabilities to provide personalized services and great experiences. SAP Cloud Platform is SAP’s platform-as-a -service (PaaS) solution. SAP Cloud Platform includes a full range of related services that facilitate personalization of customer related services. SAP Cloud Platform includes a complete set of integration tools that feature application, data, API management and workflow orientated capabilities. In addition, SAP Cloud Platform includes a complete set of digital experience development capabilities, like mobile, portal, runtimes, and data persistence, that are needed for intuitive, easy-to-use digital applications. 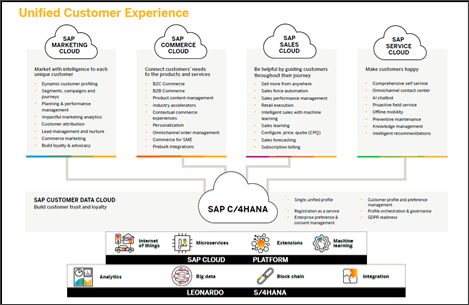 SAP Cloud Platform is not tied to a single line of business vertical, and therefore in terms of customer-first approaches can leverage data sources from across the business suite to truly deliver an intelligence enterprise that focuses and works with a single view of the customer. Whatever industry you operate in, wherever your business is based, and whatever the size of your business ,SAP Cloud Platform enables customers to develop applications quickly, efficiently, and effectively. Together with SAP C/4HANA and SAP Cloud Platform, SAP provides you with the ability to implement the CRM solution you desire: Out of the box SAP C/4HANA functionality, company-specific extensions with SAP Cloud Platform, and seamless integration across data sources with SAP Cloud Platform Integration. These recent customer examples illustrate this value proposition well. Karma is a privately-held manufacturer of world-class plug-in hybrid cars that use advanced, sustainable gas-solar technology. As hyper-connectivity and digitization transform the automotive industry, Karma needs to be at the forefront of this revolution. Karma built its cloud foundation with SAP S/4HANA at the core. This gave employees access to real-time information, anytime, anywhere, allowing them to make the best possible decisions. It served as the central hub for connecting cloud-based solutions such as SAP C/4HANA Commerce and SAP Cloud for Customer running on SAP Cloud Platform. Mikael Elley, Karma’s Vice President and CIO, says: “SAP Cloud Platform provided the foundation for simplifying interactions with our customers and dealer network.” The intuitive user experience delivered by SAP Fiori was added for a seamless customer experience. Using SAP software let Karma establish one integrated platform, with a suite of cloud solutions. More information on the Karma success story can be found here. Another example is Shell Aviation, which recently introduced a new end-to-end refueling data capture solution called SkyPad, that is designed to optimize refueling operations, resulting in streamlined turnaround times. SkyPad is being rolled out at every Shell operation in over 100 locations across four continents. On average, Skypad’s introduction has saved over 13 hours per day per airport, which translates to around 16 minutes per plane (a 33% improvement). Skypad replaces paper-based processes connecting fuel provider and customer throughout the refueling process. Real-time data gives operators the information they need at their fingertips to improve decision making and efficiency. The stock management software helps increase security of supply as well as cost of sale information. “We innovate with a focus on customer benefit. Airports want smooth and safe operations, which in turn allow airlines to take their customers to their destinations without delays. SkyPad is one of the ways we help them achieve this and help them be more competitive” says Anne Anderson, Vice-President Shell Aviation. More information on the Shell Aviation customer success story can be found here. These SAP customer examples show how taking a customer-centric approach can result in faster performance, more accurate data, improved customer experience, accurate real-time business insights ,and an optimized relationship. SAP is here to help with our intelligent enterprise orientated suite of solutions, SAP Cloud Platform for extensions, and SAP Cloud Platform Integration for a seamless, real-time landscape.